Paris attraction-guides.com - Paris, France attractions guide featuring Paris, Ile-de-France Disneyland Paris information, including location, contact details, opening hours and general Paris, Ile-de-France, France FR Disneyland Paris information. - Last updated 30/10/2012. 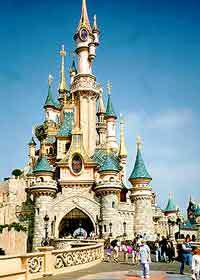 The spectacular theme park Disneyland Paris covers 607 hectares / 1,500 acres, and features thousands of hotel rooms, a convention centre, an entertainment and shopping complex, and sports facilities. Made up of five 'lands' - Main Street USA, Frontierland, Adventureland, Fantasyland and Discoveryland, Disneyland Paris boasts different rides, attractions and restaurants.